People display the graceful dolls in ancient court costumes on a tier of 7 shelves covered with scarlet cloth for the festival of dolls on March 3. 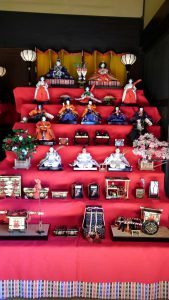 These dolls represent Emperor and Empress, the court ladies, the ministers and the musicians. The girls are expected to be as elegant as these courtly ladies.